Wolfhill is set in the northern suburbs of Glasgow in I believe the former county of East Dunbartonshire. The line was a joint Caledonian & North British venture. The line leaves the Glasgow Queen Street to Dumbarton line at Wolfhill Junction to the west of Maryhill. Wolfhill Junction is on a triangle with platforms on all three sides. The branch is double track along its full length. With the exception the last quarter of a mile into Wolfhill which is single. The up line was used here to provide a longer head shunt to cater for the cement traffic. There is one intermediate station on the branch Wolfhill Central. Wolfhill Central has four platforms. Some trains start & finish their journeys here. Today this could be the starting & end point for an electric cross city service to the South via Glasgow Central low level to a southern terminus at Motherwell. 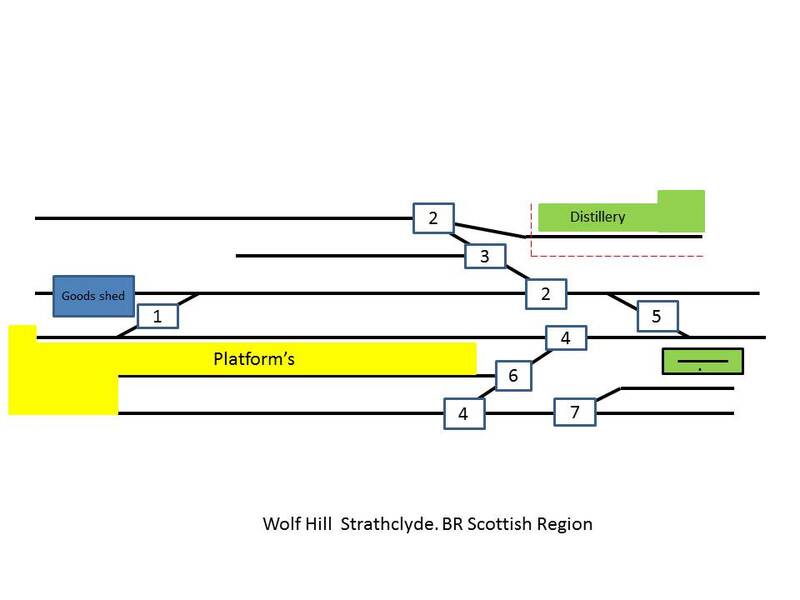 Wolfhill has two platforms a three road goods yard & a small disused engine shed plus the distillery siding. The line is mainly passenger orientated with a small goods yard dealing with the usual goods delivered to such yards (Coal, Fuel Oil & General Merchandise). There is also a thriving Cement Industry and a small Distillery that takes in grain & sends out finished product by rail. The layout is set in the mid to late 1970’s. The passenger service is in the care of the Greater Glasgow PTE now Strathclyde PTE. It will also be able to operate as a 60’s mixed steam /diesel layout or a Regional Railways Scotrail era layout. The passenger service is a clock face service with train in & out every 15 mins. East bound services serve Glasgow Queen street (2 trains an hour) & Wolfhill Junction (2 trains an hour, 1 train going to Dumbarton Central). There are a couple of loco hauled trains a day from Glasgow Queen Street to Oban and returning. There are at least 3 to 4 parcels trains a day which can bring the odd larger than normal loco’s to the station. There are also times when the rear siding behind Platform 2 is used to store locos that can’t get in to Eastfield Depot. Are mainly formed of two or three car DMU’s. At busy times these can be added to forming 4, 5 or 6 car sets. The Glasgow Oban trains are formed of 4 coach Mk1 or Mk2 sets hauled by either Class 24, 26, 27 or 37 diesel locomotives. Hauled by Classes 08 to 47. Usually hauled by Classes 20 to 47, but there may be a mainline surprise found filling in, you never know. The track is all Peco code 55. All the points are live with the polarity of the frog being switched through point levers made by DCC concepts and there are no isolated sections of track. The points are operated by Peco Solenoid motors. The layout uses DCC control using a Digitrax system equipped with Duplex Radio control. All the buildings used on Wolfhill are from the Farish Scenecraft range of resin buildings. Sadly most of these buildings are no longer available and have been obtained from eBay . All ballast & flock powder is Woodland Scenic’s. The back scene is a mix of Peco & Builtezzi sheets. There has been one negative side to the construction of the layout which will be avoided in future and that is the cork underlay. It has ad is still causing me problems with the ballast. I have also been working on my Regional Railways fleet of Sprinter units. I can now couple all current Sprinter models together. The layout might be shown in this period at a later date. All being well the layout will be on show at the York show in New Earswick in September this year. Wolfhill has been a first for me in many ways. Thankfully the pros have outnumbered the cons. If you are interested in this layout, grab me for a chat at any meet where I will be happy to explain how everything worked & the next project Clapham Rye a BR Southern Region layout. A mixed unit DMU formed of Class 101 & Class 108 (leading) on an all stations stopping service to Dumbarton Central in Platform 1 at Wolfhill. Whilst a Class 03 places two parcel vans in Platform 2 for a later service to Glasgow Queen Street. A busy moment in this ‘late 80's shot’ of Wolfhill, with Regional Railways Scotrail 4 car Class 156 units on the 08:47 service to Oban & a mixed Class 150 & 156 service on the 09:00 all stations stopping train to Glasgow Central. All the sprinter units currently made by Dapol & Farish and can be coupled & uncoupled from each other. Track plan of Wolfhill. The numbered squares correspond to the leavers on the control panel.